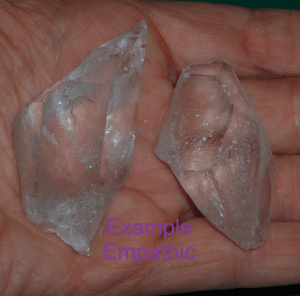 Empathic crystals are broken, chipped and otherwise damaged crystals. 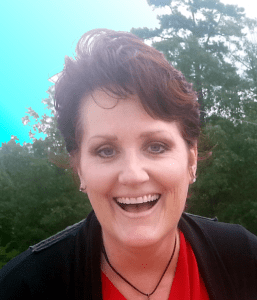 Empathic crystals bring out compassionate feelings in us. 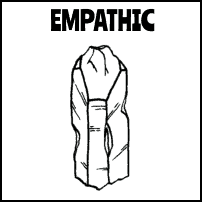 The crystal picks up this empathy and amplifies it. Often the lesson of Empathic crystals is to remember to be compassionate and empathetic to our OWN chips, dings and perceived flaws and to remember we are still beautiful, whole, lovable and worthy. Blingy Arkansas quartz crystal cluster, water clear and shiny, Empathic with lots of contact dings but you really can’t see the damage unless you look for it. This is an Empathic Arkansas quartz crystal point with Keys and Lineated Sides. Double Terminated Tabby or Tabular Arkansas quartz crystal point, Empathic (chipped or dinged) with a partial Bridge, some iridescent natural rainbow aura, Lineated Sides and an Inner Child point. Empathic Arkansas quartz crystal cluster with a few chips (contact dings), an all-quartz cluster made up of all large points, a large Key and has not seen an acid bath. Arkansas quartz crystal cluster has an all quartz matrix with points on the bottom, natural (uncleaned) with some rust and clay trapped, slightly Empathic. Empathic Arkansas quartz crystal cluster has a thick sandstone base, some clay and mineral still present from the mine, and an “X” of quartz vein running through the base of the matrix. Empathic Arkansas quartz crystal cluster with some chipped or missing points. It has a gentle energy. Empathic Arkansas quartz crystal Tabby or Tabular crystal point with Record Keeper markings, lots of Fairy Frost and Mirror Fractures. Large, Empathic Arkansas quartz crystal chunk, heavily Self Healed on one side, full of Fairy Frost, Mirror Fractures and Rainbows. Slightly Empathic Arkansas quartz crystal point with a large area of Growth Interference. Dense and cloudy (Feminine), has some orange clay trapped in the crevasses. Feminine Arkansas quartz crystal point with Golden Healer coating towards the base and some chipped (Empathic areas) with a dark grey inclusion in the base. This is an Empathic Arkansas quartz crystal point with a large Imprint and some clay still on it from the mine. 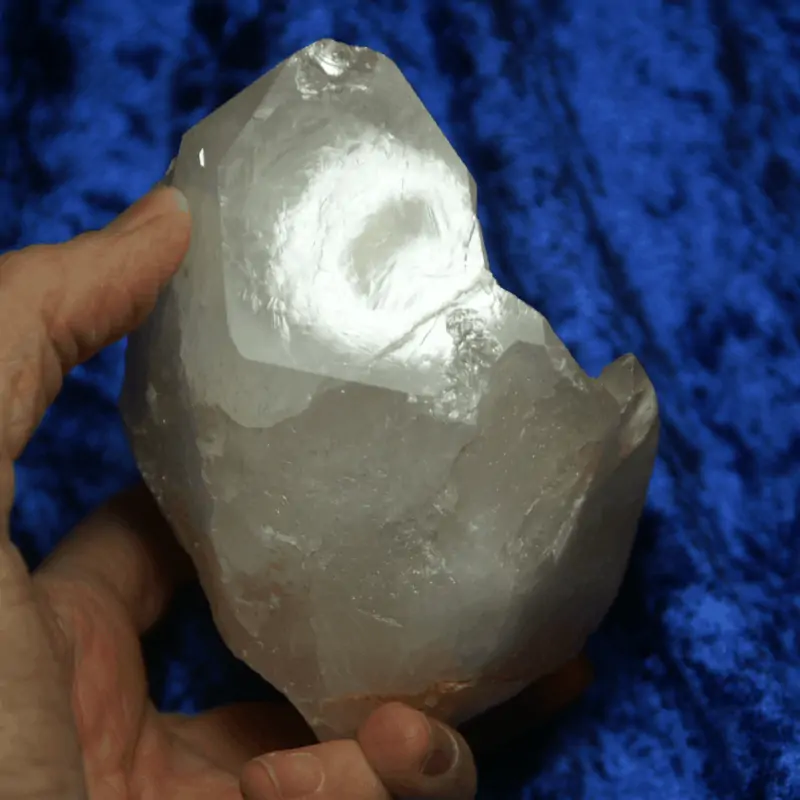 This Arkansas quartz crystal is missing half of its body, making it Empathic (chipped or damaged). However, all of the areas that were broken are Self Healed.